Current: Visit us at WestPack! Stop by and see us in Booth #5020 from February 10-12, 2015. We look forward to seeing you there! Dorner’s SmartPace is a pacing conveyor that takes a randomly spaced product and paces them into even spacing. The system is designed with two variable speed belts and a movable conveyor junction. As randomly spaced products enter the conveyor, the photo eye detects the product spacing. The servo motor control automatically varies the conveyor speed and conveyor junction placement to generate even spaces. Also, the system is completely non-contact, helping to reduce possible damage to the product. The 2200 SmartFlex conveyors are designed and shipped to keep things simple! Each conveyor is completely assembled and tested at Dorner. It is then partially disassembled into sub-assemblies for shipping. This ensures that set-up is fast and easy once your conveyor arrives. 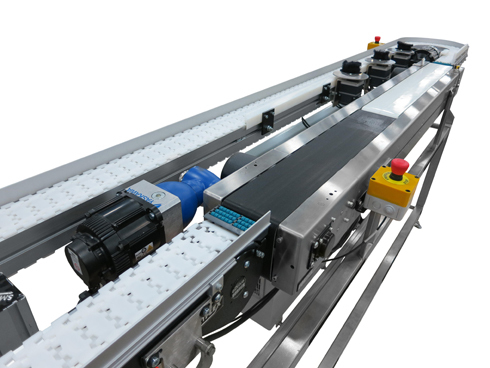 The SmartFlex is capable of multiple curves as well as inclines and declines on a single conveyor, providing complete flexibility in design and layout. This model uses the high performance bearing chain which allows up to 4 curves on a single conveyor. The AquaPruf Ultimate conveyor’s open and hygienic design is ideal for a sanitary environment. It provides fast access to the conveyor frame without tools by utilizing belt lifters, clean out windows and tip-up tails. The 7600 AquaPruf is also USDA certified accepted equipment. Learn more about our sanitary line here.